Motivate employees to create performance? It should be like this! How to make the employee incentive system more interesting and interesting under the premise of controlling costs? The cooperation between WeShare Interactive and China Pacific Insurance （CPCI）provides a good solution. As an influential industry representative, CPCI does not seem to be a problem. However, in the face of fierce competition in the industry, sales staff will become an important part of the company's performance. Whether to maintain the enthusiasm of the sales staff will determine success or failure. To this end, we have designed a lottery system where successful contract salespeople can participate in sweepstakes, which can provide ongoing profit incentives and control business costs. 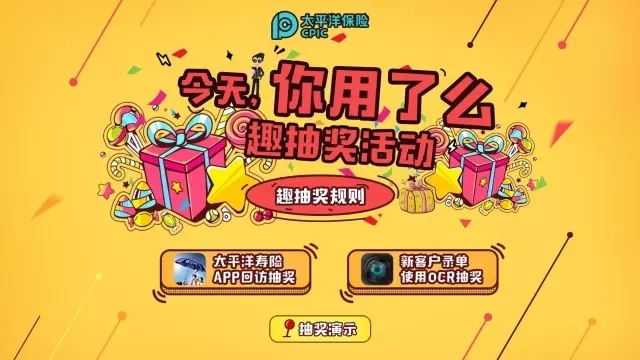 Through a seemingly simple lottery system, it relies on the wisdom of Weishang Interactive and Pacific Insurance to solve the problems many companies will face. In fact, not only insurance, education, tourism, jewelry, watch industry, etc., as long as you want to motivate employees to come up with a fun and stylish incentive, you can introduce this lottery system to motivate employees.